Cost of construction max: Taking into account his little area and his position in the Paris region, the cost of the building is in the average for France. 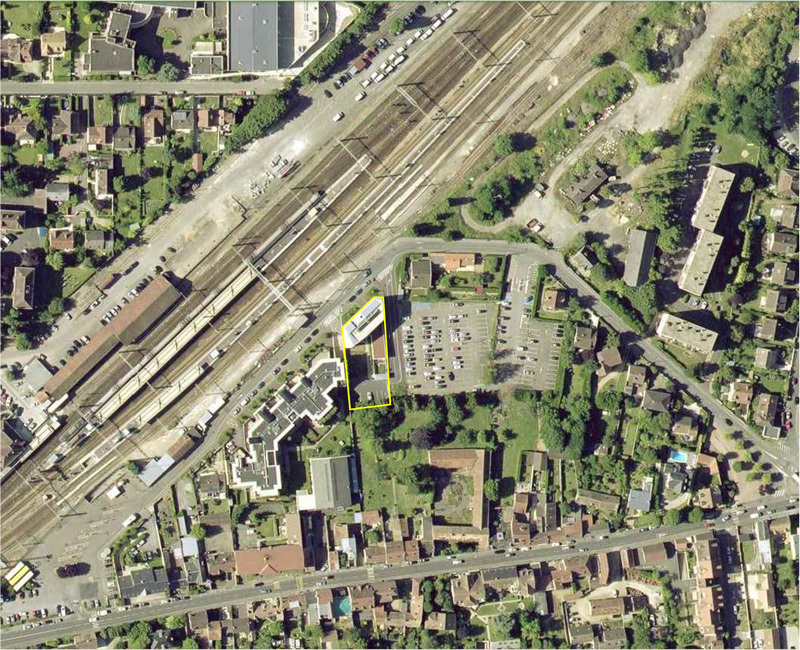 Rental/sale cost compared to market price: The transition centre is destinated to homeless people and is managed by a social organization (CCAS) from the city of Rambouillet. No rents are requested from the residents but the organization gets subventions from the state. Rules of allocation: The CCAS decides for the attribution rules. Protection of fragile categories: The transition center accomodate exclusively homeless people. His vocation is to support and to reintegrate weakened and isolated persons, to return in a social life. Community accompaniment in the life of the building: These persons in need are supported by a social worker but also by volunteer of the association of the family gardens of Rambouillet for workshops in the shared gardens. 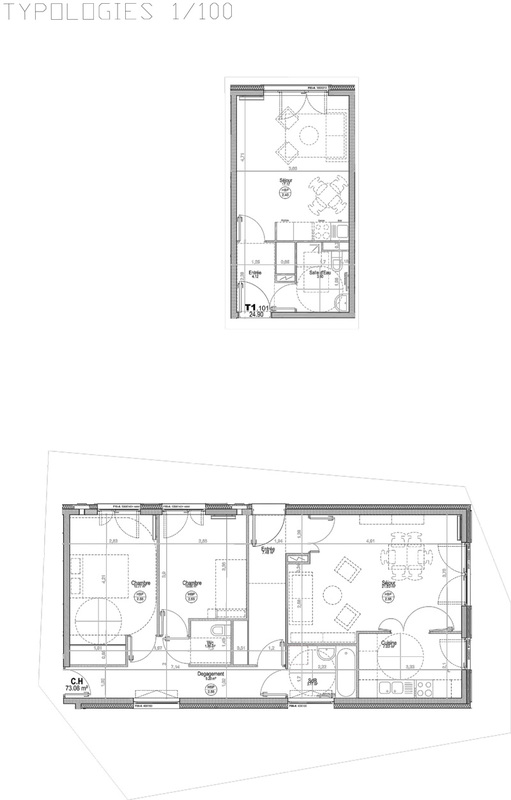 Functional mixitè: In addition to the 19 apartments, from the studio to the 2 rooms, the transition house includes four independent emergency rooms and one accomodation for the social worker. 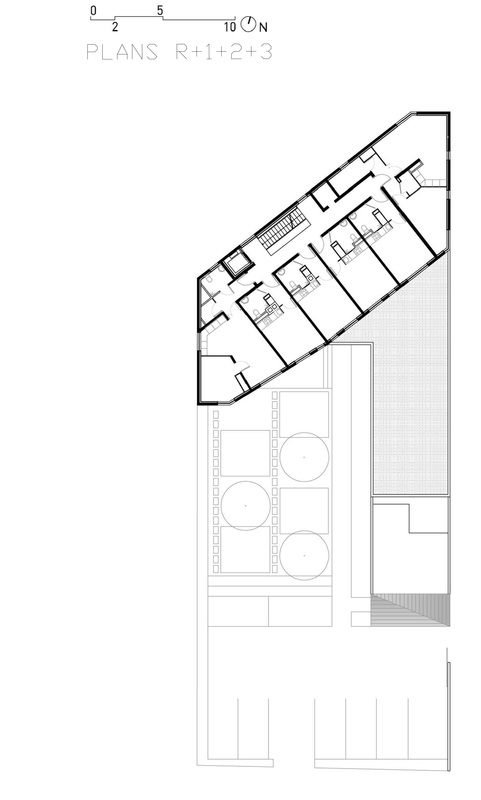 Common spaces and shared living: The house has been designed for encourage meetings and create social link between the inhabitants. 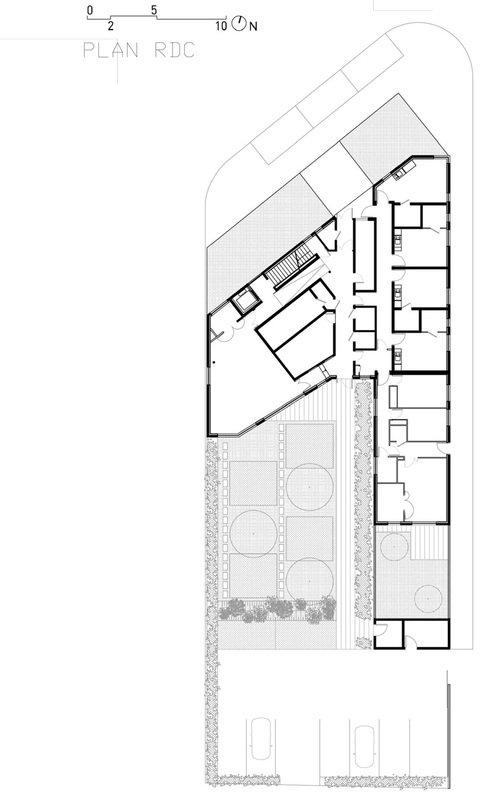 The corridors are like public space and invite to use the common spaces : the large common room, the shared garden, the common laundry room and TV room. Techniques and strategies for environmental saving: Thanks to his bio-climatic organization, the living rooms located in the south are very luminous and quite and look at the sunny garden. Thanks to solar pannels which produced 50% of hot water and a reinforced insulation, the building got the label “Housing and Environmental profil A”. 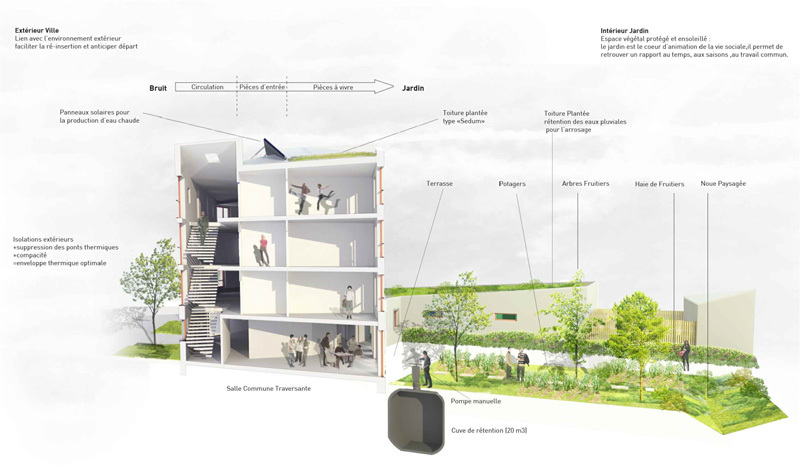 If the first vocation of a transition centre is to support and to reintegrate weakened and isolated persons, to return in a social life, the environmental anchorage point of the building also participates in this function by articulating the social and environmental actions. 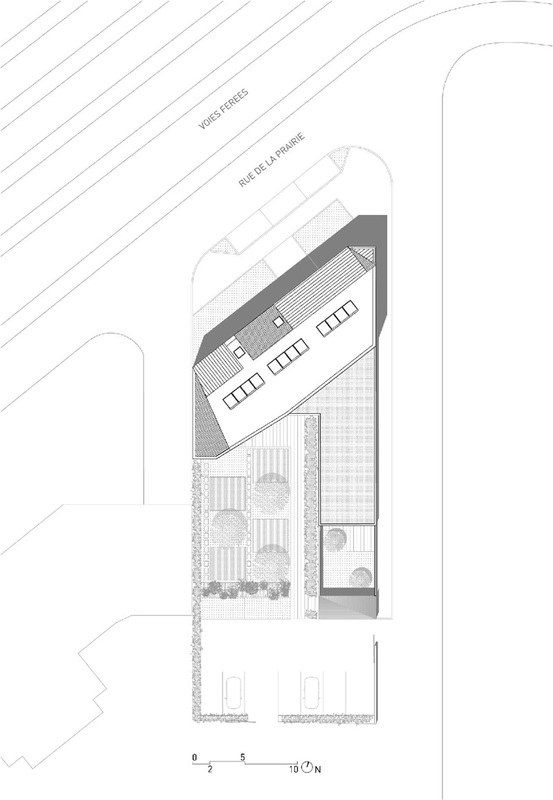 The position of the building, in set square, along both streets, creates a sunny garden sheltered from the noise pollutions of railroads. The garden is the center of the social project. Its arrangement has kitchen garden, shrubs and fruit trees. It will supply the users with a collective activity : to collect ” the fruit of their work “. A volunteer of the association of the family gardens of Rambouillet will regularly come to liven up garden-workshops in order to help the tenants in their social inclusion. The retention of rainwaters for the watering as well as a collective compost will assure an environmental management of this green heart. The bioclimatic setting-up led towards the strict distribution of the program. The living-rooms and the bedrooms open generously to the South, on the garden, the light being used in a therapeutic way. On the North facade, are the bathrooms, the technical rooms and the landings. Landings are used as a public place to facilitate meetings between people, to develop a strong social link between the users, and to invite them to come down in the ward instead of locking themselves into their room. 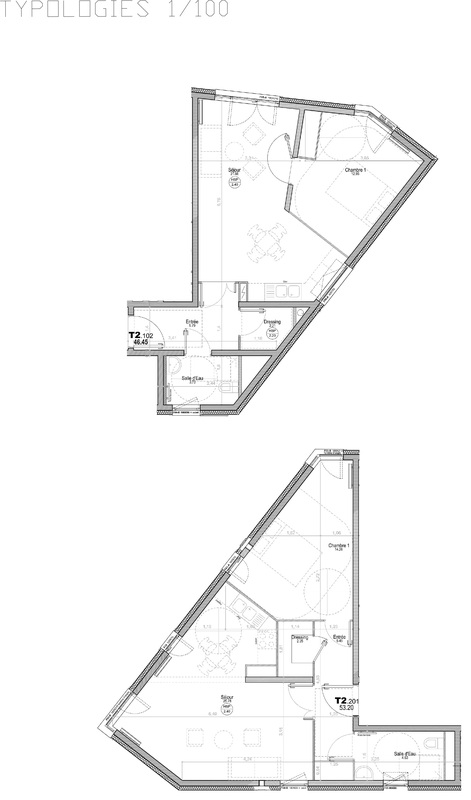 Therefore, the staircase are opened up with an empty space putting in relation the various levels. The space is bathed by light and offers views on railroads as sign of a new start. The building has the label” Housing and Environment profile A ” with a strengthened heat treatment. The domestic hot water is produced in 50 % by solar panels. Every apartment possesses its meters in water, electricity and heating with regular points of consumption to give responsibilities to every person for their future return in the social life.